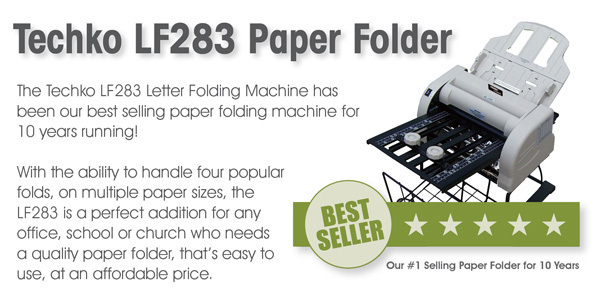 The Martin Yale P7400 Letter Paper Folder is small and easy to store. This machine does most common folds and a continuous feed of up to (50) sheets of 20# Bond Stock. Able to accommodate most copy papers and letterheads, this unit is sure to be a success in any small office or moderate mailing environment. This machine is not recommended for heavier materials, card stock or glossy paper. - Dimensions: 20" x 13" X 10"
- Weighs approx. 17 lbs. *Due to a requirement of the manufacturer, dealers of Martin Yale products are not allowed to offer an EXCHANGE or RETURN. Any warranty or repair issues must be taken up directly with Martin Yale. All of our Martin Yale machines are new and come with a full manufacturer's warranty backed by genuine Martin Yale quality!